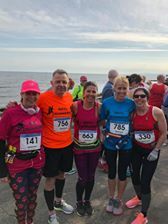 The Bespoke Fitness Coastal Half Marathon on Sunday 14th April brought together two of the regions Run Wales social running groups, Porth Eirias Runners and Rhyl Runners, with members from both groups enjoying the flat course. 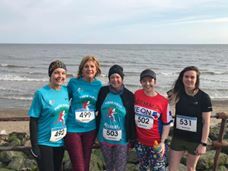 Despite the sun being out, the runners had to endure a headwind the whole way from the start at Porth Eirias until the end at Prestatyn. 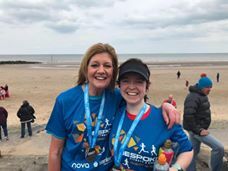 Waiting at the end to give out medals, water and t-shirts were other members of Rhyl Runners who had volunteered for the event after also hosting another successful Prestatyn Prom Junior parkrun.